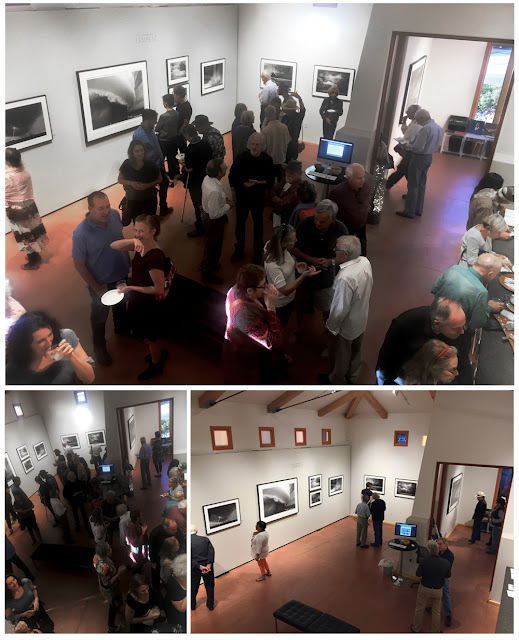 photo-eye Gallery Tempest Opening Night Highlights, Google Talk with Mitch Dobrowner, & Hurricane Relief photo-eye Gallery shares images from the opening of Mitch Dobrowner's exhibitionTempest, the artist's recent lecture and exhibition at Google, and our support for Direct Relief in their effort to aid those affected by hurricanes Harvey and Irma. A sincere thank you to all who attended the gallery opening of our new exhibition, Tempest last Friday, September 15th as well as the Artist Talk given by Mitch Dobrowwner on Saturday the 16th. Tempest features the debut of new work in Dobrowner’s ongoing series STORMS celebrating nature's beauty, power, and energy. Tempest will be on view at photo-eye Gallery through November 11th, 2017. This past summer represented artist Mitch Dobrowner was honored to lecture and exhibit at Google's Venice California Studio Facility as a part of the company's Talks at Google series. The exhibition was installed from May 30th – September 4th, 2017 and contained 21 selected works from Dobrowners Still Earth and Storms series in sizes ranging from 7x9" to 34x50". 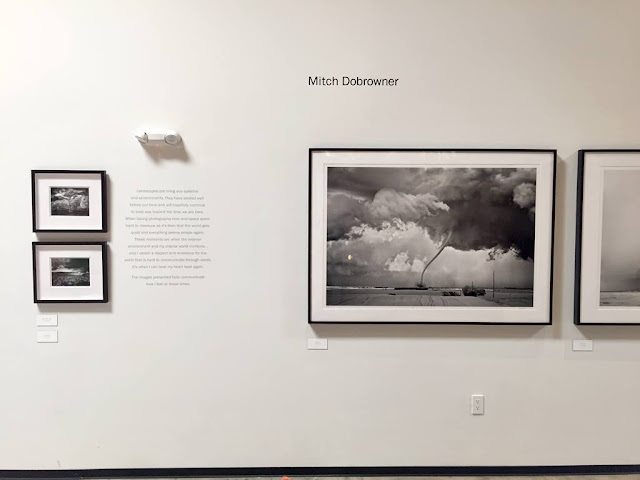 In his lecture (video above), Dobrowner speaks in detail about his early beginnings in photography, being unexpectedly courted by National Geographic, as well as sharing stories surrounding a few of his iconic images such as Shiprock Storm and Rope Out. It is a joy to hear Mitch speak about his approach to photography and reverence for the landscape in his humble, gracious, and good-humored manner. The full lecture is just under an hour long. Mitch Dobrowner's work installed at Google's Venice, CA Studio Facility. Image courtesy of the artist. Detail of Mitch Dobrowner's work installed and didactic panel at Google's Venice, CA Studio Facility. Mitch Dobrowner and photo-eye Gallery are donating 10% of all proceeds from Tempest to Direct Relief in their effort to aid those affected by hurricanes Harvey and Irma. 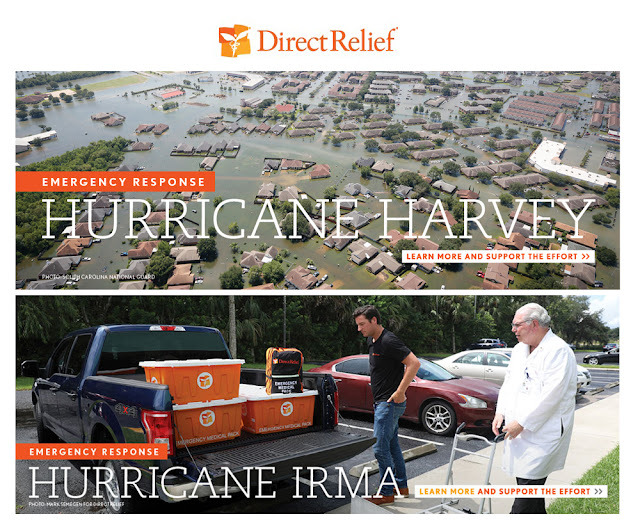 Direct Relief has an efficiency rating of 100% from Forbes and provides targeted assistance to help safety net providers prepare for and respond to emergencies. Response efforts—which include distribution of pharmaceuticals, medical supplies, personal care items, equipment, and cash—are swift, involve local partners, and are coordinated with other nonprofit organizations and public health authorities to ensure the most effective use of resources.